Ludia has partnered with DreamWorks Animation to release a mobile trivia game based on DreamWorks Animation’s upcoming film Mr. Peabody & Sherman. The app combines the feel of a game show and a board game, as players travel back in time in the WABAC machine, answering questions about historical events, movies, music, animals, sports and more. In each round of the game’s Adventure Mode, players must answer a set number of “true or false” questions correctly before moving on, without running out of lives. Each round requires energy to access, but this energy (fuel for the WABAC machine) can be won after completing levels, or can be purchased with real money. Groups of levels are presented in 10 different eras, including Ancient Egypt and the French Revolution. Outside of the game’s story mode, players can compete against others in Challenge Mode. Here, each round has five multiple-choice questions, and players are rewarded points based on the speed of their correct answers. In Challenge Mode, incorrect answers disappear over time to help players out, and users can call one of the movie’s characters for help if they’re really stumped. 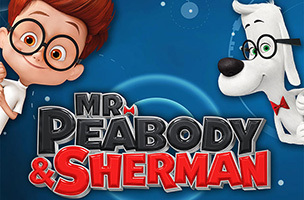 Mr. Peabody & Sherman is set for release in theaters on March 7, but the game is now available to download for free on iOS. Check back soon to follow it on AppData, our tracking service for mobile and social apps and developers.